The Centanni-Cottle Memorial 5K winds 3.5 miles through Rick and Robert’s hometown of Yorba Linda, California. The 5k route passes by all three schools Rick attended, starting just south of Fairmont Elementary and continues south down Fairmont Boulevard past Bernardo Yorba Middle School then west on Esperanza Road and finally north on Kellog Drive ending at Esperanza High School. T-shirts, memorial wristbands and other items to the first 800 participants. Entry fee is non refundable. 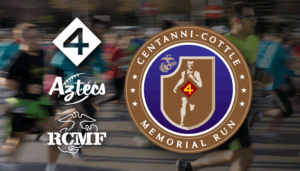 Proceeds benefit the Rick Centanni Memorial Fund, Kaila Cottle Trust in memory of her father SgtMaj Robert J. Cottle, Semper Fi Fund, Wounded Warrior Project, The American Legion, Fisher House and one additional military based charity of the Executive Board’s choosing. $40 Pre-registration until March 30th, 2019, $45 post–entry and on race day, $20 for students and military, free for children under the age of 12. 7:00AM | Bib Pick-Up & Race Day Registration Opens at Esperanza High School student parking lot. From here shuttles will take runners to the starting line at Fairmont Elementary School.